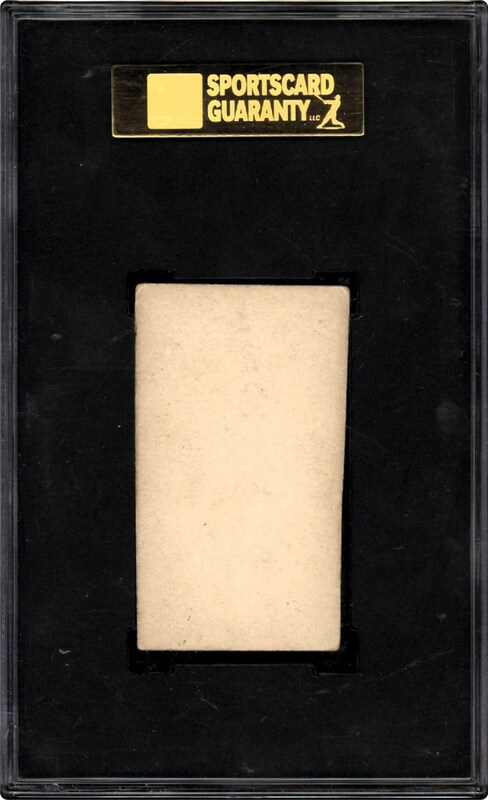 Lot # 465: 1887 Old Judge N172 Roger Connor “88-1 Hands on Knees” Pose (SGC 60/5) – “1 of 3; Only 3 Graded Higher for SGC Encapsulated Connor Poses! 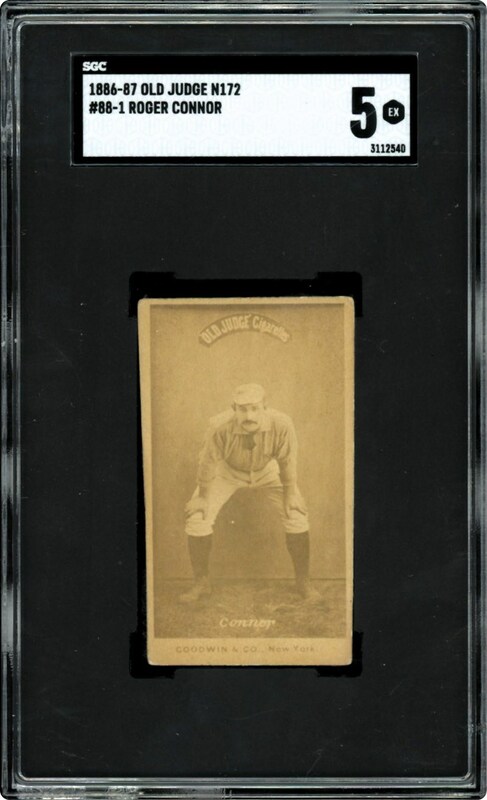 1887 Old Judge N172 Roger Connor "88-1 Hands on Knees" Pose (SGC 60/5) – "1 of 3; Only 3 Graded Higher for SGC Encapsulated Connor Poses! There are five different known N172 Old Judge poses of the Cooperstown inductee Roger Connor with one of those highly coveted subjects being his "88-1 Hands on Knees" image as presented in the renowned periodical "The Photographic Baseball Cards of Goodwin & Company (1886-1890)." Presented here just happens to be that legendary pose graded a superb SGC 60/5, and exhibiting an 1887 issue date. While SGC's census report indicates a mere 2 other Connor Old Judge specimens at this plateau with only 2 graded higher, their "pop" data does NOT distinguish between the five separate Connor poses. Therefore, this magnificent offering possibly qualifies as the finest "hands on knees" Connor on SGC's population report. Few people realize that it was Hall of Fame 1st baseman Roger Connor's all-time home run record of 138 that Babe Ruth surpassed when, in 1921, the "Bambino" slammed 59 round trippers. Furthermore, the 1st and 3rd sacker ended his career with an outstanding .316 batting average, batted in over 1,300 runs and stroked 233 triples that upon his retirement, were likewise baseball's top mark. Indeed, Connor was our National Pastime's original "Home Run and Triples King", and synonymous with that notion is this outstanding N172 prize that proudly stands as one of the premier examples on the globe. His stellar sepia-toned image portrays fine contrast and clarity, with the timeless pose well centered between four clean borders. The "GOODWIN & CO., New York" caption affixed to the lower border clearly indicates this offering is an 1887 issue, no major surface abrasions are evident, and the eye pleasing surfaces include an unsoiled verso. The assessment is primarily due to even corner wear that actually portrays an aesthetically pleasing uniformity. However, as any 19th century enthusiast realizes, it is the eye appeal of the real photo image attached to the front side that is the basis for Old Judge desirability. What could be more appealing than a Hall of Fame Old Judge artifact that stands as one of the finest examples extant, and deservingly so, merits a final resting place in any esteemed 19th century gathering!